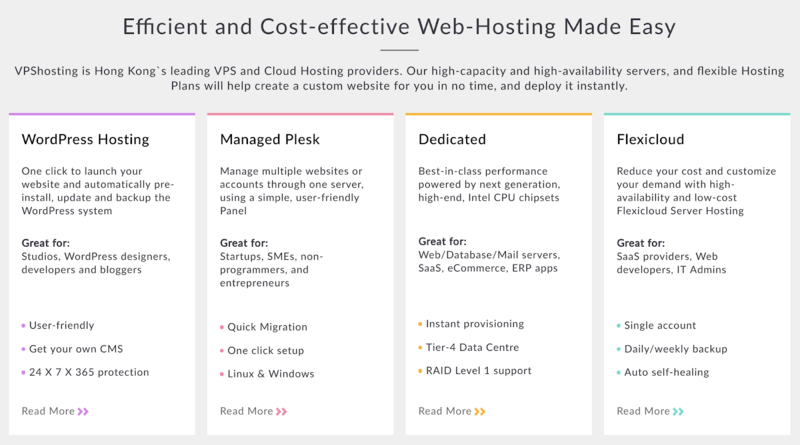 VPShosting Review 2019: Is VPShosting a Good Hosting? A Hong Kong-based website hosting provider with a network of servers around the world, VPShosting has an impressive uptime SLA and 24/7 customer support. Established in 2007, VPShosting is one of Hong Kong’s leading hosting companies offering a full range of hosting services, a great uptime guarantee, and 24/7 support. With a customer base mainly in China and other parts of Asia, they use multiple data centers located in China, Japan, and the U.S.A. Their website can be switched between English, Japanese and Chinese. VPShosting offers a large selection of website hosting plans including WordPress hosting, Linux and Windows virtual private servers, managed cloud servers, and dedicated server rental. The WordPress plans come with a one-click installer, automatic updates, and free WordPress migrations. And they are supported by a team of WordPress experts. While these WordPress plans offer excellent solutions for small websites and blogs, more advanced website owners will be pleased to hear that VPShosting also offers a full range of hosting services that are perfect for scaling your online business. With more than 90 points worldwide, 24/7 monitoring, and a 99.999% uptime record, their infrastructure is impressive. It is fully redundant with an uninterruptable power supply, and their servers are equipped with solid-state drives (SSDs), which – due to the lack of moving parts – are more reliable and faster than hard disk drives. Not only is VPShosting’s data center ISO27001 certified, but also it is Leadership in Energy and Environmental Design (LEED) Gold and uses 100% renewable energy. VPShosting’s WordPress plans are quite expensive compared to other Hong Kong companies and international providers, but the presence of servers in Hong Kong, China and other parts of Asia could be worth the extra cost for Asian customers. Bear in mind, though, that SSL certificates and domain registration both cost extra. In terms of contract length, you can purchase hosting on three, twelve or twenty-four-month terms, and you get a deep discount for purchasing the longer term. They offer a 14-day “no questions asked” money-back guarantee as well as a free trial (in some circumstances). You can upgrade at any time, whilst downgrades can only be done at the end of the billing cycle. What really impresses me about VPShosting is their dedication to 24/7/365 customer service. You can contact them by phone, email, and live chat, and they have been very polite, helpful and quick whenever I have done so. In a short space of time, VPShosting has gone from inception to become one of the leading providers in Hong Kong. Not only do they now have more than 50 employees, but they also have a network of servers around the world and a rock solid uptime SLA. Wondering how VPShosting stacks up against other Web Hosting companies? Enter any other Web Hosting company and we will give you a side-by-side comparison.